Looking for a garage in Lichfield for your car service? No need to ring around or hang on the phone – find and book it online quickly and easily with BookMyGarage. Simply enter your registration number and postcode, choose a Lichfield garage and make your booking. You won’t pay a penny until the work is complete. "Really lovely staff, no problems booking for that week (on a Saturday!) very quick turnaround of my vehicle, and a helpful review of things I’d need to get fixed for the car to pass it’s MOT. As a free service this is fantastic ." "Arrived first thing in the morning, went to reception and all that was needed was to check my name, my number and to give the key to the car. When I came back to pick it up, it was during my lunch break and I assume the other staff were having their lunch as well since I was waiting for around 10 minutes or so for someone to see at the reception. When one of the staff did arrive he showed me all the paperwork, explained what the total cost was (including any other additional charges) and handed back my key. Very kind and honest staff, good place to go to." "Collected my car from home for no extra charge, courteous staff and completed the work as expected. Overall excellent service!" "Very happy with service and workmanship." "Great service efficient and well priced"
"Really happy with the prompt pick up and drop off service." 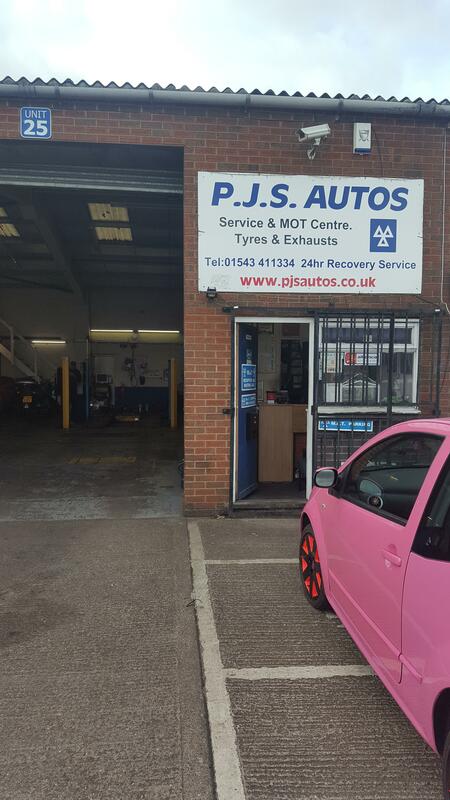 "First class, start to finish"
"Happy ll round with price and quality"
"Unfortunately the car was past my price point of repair as I had been to a less reliable garage.. But PJS did everything they could to help." "2nd time in using PJS. Great value and service. Will use them again." It’s time for your car's service again - so where do you take your car? The same garage as before - although last time you were worried you were overcharged. Here at BookMyGarage we have 3 garages in Lichfield for you to choose from, all rated by other car owners and offering fixed prices for their services. You can compare labour rates too, helpful if you’re thinking of additional car repairs you might need. We display transparent prices for car services, but you might want to consider calling our expert mechanics 03304 00 44 39 for independent and unbiased advice if you think you need a costly repair. What is the first thing you do when it’s time to choose a garage for your annual service? Do you just pick up the phone to the garage you’ve been using since you first drove a car - even if it’s miles out of Lichfield - because that’s what you’ve always done? Do you ask friends for their recommendations? Or do you compare prices, speed and quality of service, and feedback for all the garages in and around Lichfield? While this might seem the most systematic approach, it is also the most time-intensive. But BookMyGarage lets you do just that and book in your service with your chosen garage online at the same time. Not sure when your car service is due? Check your owner’s manual in the first instance, as it depends on the make, age and mileage of your car. Sometimes the last garage which serviced the car leaves a sticker on the inside of the driver’s door as a further reminder. As a rule of thumb, your car should have a Full Service every 12 months (or 12,000 miles) and a Major Service every two years (or 24,000 miles). It’s really important to take your car for regular services, for both the smooth running of your vehicle and to make matters straightforward when you sell it on. If you frequently make trips beyond Lichfield and generate a high annual mileage, consider an Interim Service every 6 months (or 6,000 miles). One of the most common and critical car problems is a slipping clutch. How long a clutch lasts varies depending on the age and model of your car, the conditions you drive in, and the way you drive so the most important thing is to know how to spot a clutch problem when you’re out driving in and around Lichfield. You might find that the revs (RPMs) suddenly shoot up but the road speed doesn’t increase. Acceleration may not be as effective as it once was. This will be more obvious in a manual car than in an automatic as the clutch usually slips during a gear change. Expect to pay in the region of £400 to have your clutch replaced but make sure you get the best service and price for you by checking Lichfield garages with BookMyGarage. Whether you’re driving in Lichfield or further afield, think about road user etiquette. Showing respect for other road users makes driving more pleasant for you and safer for everyone. For example, if you have to make a last minute change of lane, make your request to change clear to the driver who will need to let you in - and signal your thanks if they do. Be ready to abandon the change of lane if they won’t play ball - your safety (and that of other drivers and pedestrians) is more important than getting to your destination in the shortest time possible. When the position is reversed and a driver asks your permission to change lanes, allow them to as long as it is safe. If you get frustrated, avoid using your horn - it won’t improve matters and might make them considerably worse.